Every music venue is constituted by an amalgam of characteristics. The proportions of which give rise to their unique atmosphere. The Newport Music Hall (a Promowest owned venue), in my opinion, is a perfect concoction. There's a particular aura that emanates from the walls of "America's Longest Continually Running Rock Club" that is only fully understood by experiencing it first hand. Since its conception as a theater and ballroom in 1922, the club has undergone several name changes before becoming The Newport in 1984, but the original architecture and decor remain. Its nostalgic personality and warm characteristics synergize to create a vibrant energy appreciated by both performers and the crowd. Toting a capacity of 1700, The Newport is just the right size. 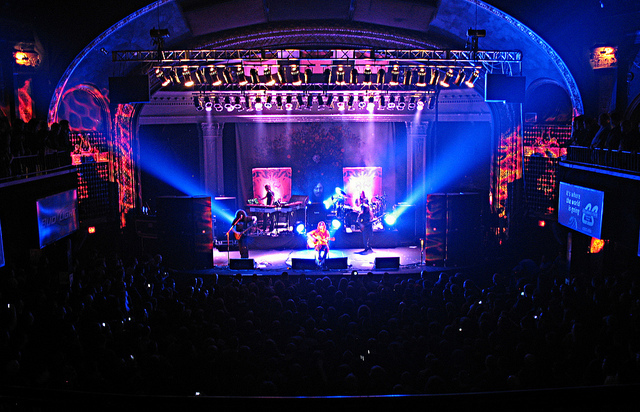 You get the acoustics and acts of a large venue along with the intimacy of smaller ones. With all shows being general admission you can move freely between the pit and the outer terrace, both of which provide a good view. Though not always open, the U shaped balcony offers another unique way to experience the show. The acoustics are quite possibly my favorite in the city. The high convex dome-shaped ceilings centered with a medallion and decorated with original wood trim work establish a notably open yet warm sounding environment. At times it can become exceptionally loud, but if you don't mind a wee bit of inner ear damage, you'll be pleased by being wholly consumed in sound waves. The club houses a full-service bar (occasionally the second bar on the balcony is open as well) and Late Night Slice Pizza for those who work up an appetite in the pit. There's also an outdoor area in the alleyway you can access to catch some fresh air or a smoke (left-hand side if you're facing the stage).